We cannot keep Andes mints in our house for any longer than 2 days. They are perfect in this fudge and would be a great gift for anyone who has a sweet tooth! 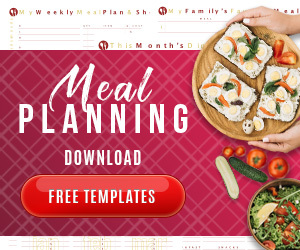 Line an 8×8 baking pan with parchment paper and spray with non-stick spray. Melt 1 1/2 cups chocolate chips with 3/4 cup sweetened condensed milk over low heat, stirring occasionally. Spread mixture into pan and chill for 10 minutes. Melt white chocolate chips and remaining condensed milk, stirring until smooth. 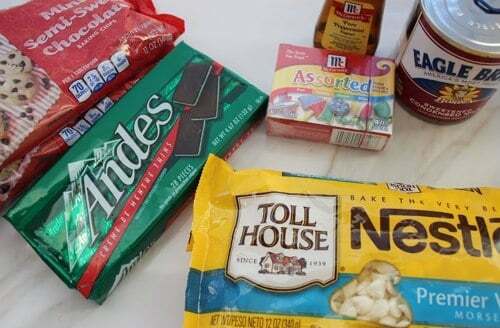 Add peppermint and food coloring. 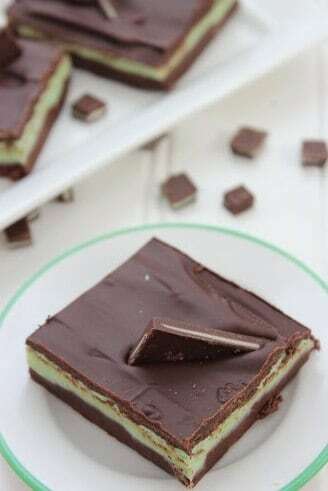 Slice Andes Mints diagonally and set aside. Spread this layer over refrigerated chocolate layer and chill for 10 minutes. Melt remaining 1 cup of chocolate chips with 1 tsp shortening in the microwave by heating 30 seconds and stirring and repeating until completely melted. Spread over refrigerated layers. Top with Andes pieces. 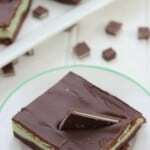 Easy recipe for Andes Mint Chocolate Fudge.